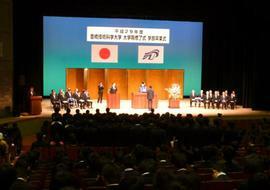 On 23 March 2018, the Graduation Ceremony for Academic year 2017 was held in AI PLAZA Toyohashi (Toyohashi Labor and Welfare Hall). 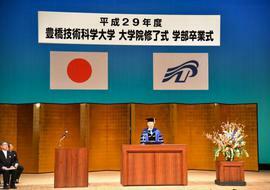 President Takashi Onishi and doctoral graduates wearing academic dresses attended the ceremony. 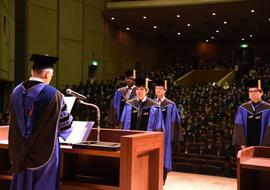 During the ceremony, 10 new Doctors (including 1 Thesis Doctor), 374 Masters and 448 Bachelors were given their degree from President Onishi. They were congratulated from their supervisors, family, friends, juniors and staffs of TUT. We hope for their brilliant brand new stages.